Steve Littler nipped over the border into White Rose territory for the top-class Thirsk 10-mile road race on Sunday, and finished 6th in 55:00 to win the M45 age category and place first in the masters results. 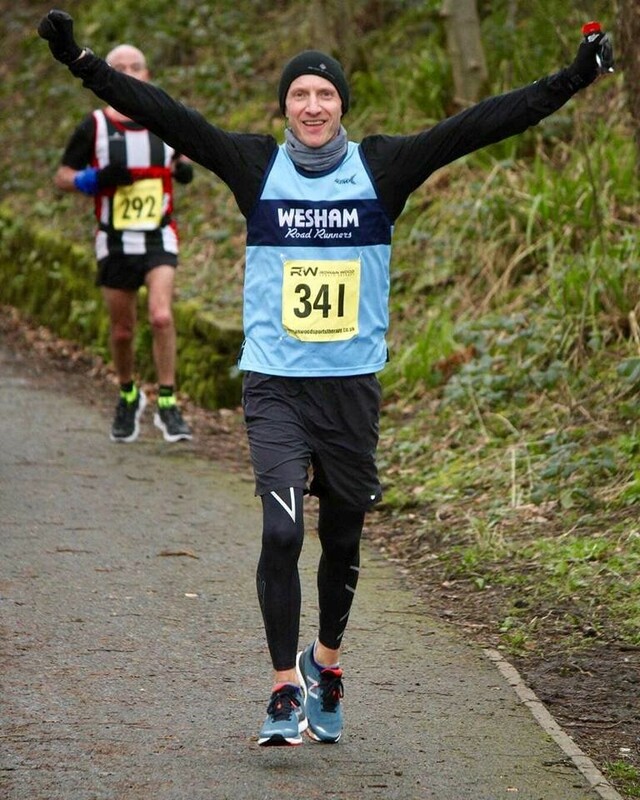 There were 5 Wesham runners in the Trimpell 20 race in Lancaster in their training and lead up to forthcoming marathons. David Taylor finished 19th in 2:10:30 with Paul Lancashire 102nd in 2:36:28. Thomas Farquhar was 162nd in 2:46:54 and Ben Wrigley was 277th with 3:00:37. David Millar was 29th M50 and 432nd in 3:28:54. Anne Berry battled the elements in the Cartmell Ultimate Trails 10km race on Saturday and finished 275th and 20th Over-50 in 71:03. Graham Brook finished 442nd in 1:23:19. George Helme ran the 5km Trail finishing 47th in 44:30 and 10th Under-16. Kelly Helme was 68th in 47:26. Fran Hodskinson finished 175th in the 18k Trail Emergency Route (shorter distance due to the extreme weather) in 66:35. Elizabeth Johnson was not far behind in 180th place with 66:43. Diane Blagden finished 262nd in 1:12:13, a great day out for the ladies. Alan Hudson ran the Fleetwood 10k which was allegedly a short course at just over 6 miles. He completed the course on a fine morning but with a stiff westerly wind off the sea in 46:47 to finish 1st M65 and 13th overall. Finlay McCalman finished 23rd in 53:06, 9th M50. It was a wet and blustery on Saturday morning for parkrunning but it did not put many people off getting out and having a good timed 5km run. At Lytham Hall Andrew harling scored a new persona best performance and was the second fastest runner of the day recording 18:57 for an M35 age graded percentage of 70.98. Finlay McCalman ran 28:05 for an M50 grade of 54.24%, with Sharlan Butcher 28:35 for W45 55.57%; Carl Groome 28:45 for M50 51.30% and Keith Wilding 29:15 with M60 55.33%. Phil Leaver clocked 29:25 with an M65 57.00%; Colin Smy 29:28 with M35 45.98%; and Sue Rigby 31:29 for W45 50.45%. In the South Manchester run in Platts Field Tracey Hulme ran 25:35 with W55 70.75%, and in Preston’s Avenham Park Anne Mayers-Smith a new personal best 23:41 for W40 64.95% and Jenn Thompson 28:11 with W40 54.58%. In Manchester’s Worsley Woods Martin Bates ran an M60 67.42% with a time of 24:12, and in Ormskirk David Taylor had the 3rd fastest time of the morning with 18:43 for a Senior age grade of 69.46%. Steven Gore was on 23:00 pacing duty and delivered spot-on with 23:01 for M35 69.46% and Vicky Gore 28:12 with W40 55.38%. In the Blackpool parkrun Dave Marsland ran 23:16 for M60 70.77% while George Kennedy scored M60 65.92% with a time of 24:33. Suzanne Leonard also ran 24:33 for W45 66.67% and Dave Young clocked 28:08 for M70 63.45%.